In 2005, Dr. J. C. Sanford wrote a book entitled Genetic Entropy and the Mystery of the Genome (Elim Publishing, 2005). Dr. Sanford is well-suited to write a book on genetics, given that he has a PhD in plant breeding and genetics and holds more than 30 patents in his field. While the main thrust of the book is that the field of genetics as we understand it today provides little evidence for evolution and an enormous amount of evidence against it, there are some fascinating “side issues” he brings up from time to time. I was reminded of one of those side issues on Friday when a student asked me why the patriarchs in Genesis lived to be so old. Noah, for example, lived to be 950, according to Genesis 9:29. Given today’s lifespans, that seems pretty outrageous. How could Noah possibly have lived that long? Also, even though his descendants didn’t live as long as he did, they still lived longer than anyone today. Noah’s son, Shem, lived to be 600 years old, according to Genesis 11:10-11. Noah’s grandson, Arphaxad, lived 438 years, according to Genesis 11:12. 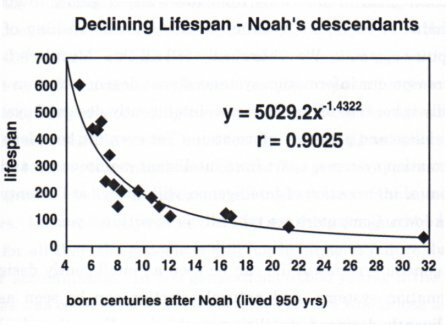 If you continue through Noah’s line, you will find that (on average) the later a descendant was born, the shorter life he led. Nevertheless, it takes many, many generations for the lifespans of the patriarchs to reach what we would call reasonable based on today’s standards. Of course, one way to deal with this issue is to say that the ages of the patriarchs in Genesis are not accurate. Instead, as a kind of “hero worship,” the writer of Genesis artificially inflated the patriarchs’ ages to make them look “larger than life.” In his book, Dr. Sanford not only shows why such an explanation is probably not correct, he points out the data that indicate a decay in lifespan is exactly what you would expect given our current understanding of genetics. Lifespan of the patriarchs versus when they were born after Noah. Actually, that’s a bit of a false dichotomy. The author of Genesis could also have been lucky. He could have just made up some numbers out of the blue, and they could have followed an exponential decay pattern simply by chance. Of course, the odds of such a thing happening are pretty low, but as I have pointed out many times on this blog, with enough faith, you can believe anything. So given that the decay of lifespans as reported in the Bible looks biologically accurate, what is Dr. Sanford’s explanation? In his mind, it is all about genomic decay. He produces quite a bit of evidence to show that the human genome is decaying fairly rapidly due to mutations. As a result, general health and life expectancy are decreasing right along with it. Thus, the reduction in lifespan that we see reported in the Bible is simply the result of genomic decay. Now, of course, with the rise of modern medicine, sanitation, and good nutrition, we can overcome some of the problems associated with genomic decay. As a result, we are living longer and healthier lives than those who lived in the past few generations. However, the effect of genomic decay is significant enough that even all of modern medicine cannot bring back the lifespans of Noah, his children, or his grandchildren. According to Dr. Sanford, then, the patriarchs in Genesis lived so long because their genomes were more “pristine.” The human race hadn’t been around for very long, so the human genome had not decayed much. 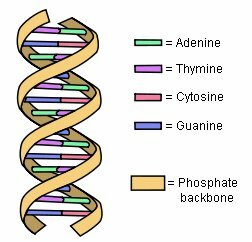 As time went on, more and more mutations accumulated in the human genome, resulting in more and more genomic decay, which in turn led to shorter and shorter lifespans. Is there any particular reason given that pre-Noah the lifespans were just in the 900s, with Methusela peaking at 969? I would expect that with a 100% pure genome, the human lifespan still would have an overall limit, and the high 900s represents that limit. Thus, a lot of people lived to be that old until genomic decay set in. Once genomic decay set in, lifespan fell accordingly. I am just speculating, of course. But would there be any reason for decay to set in with Noah rather than with Adam and the Fall? Good question! I think the better way to look at it is to wonder if there is any reason for genomic decay to set in after the Flood. I would think so. The Flood radically changed the environment, and that clearly didn’t work out well for some animals, like the dinosaurs. While there is no way to know with any reasonable certainty what the pre-Flood environment was like, it is reasonable to assume that mutation rates were lower back then. For example, most modern reptiles have a lifespan of under 70 years. There are some exceptions (like the tortoise), but in general, most reptiles don’t live past 70. Paleontologists estimate that dinosaurs lived up to 300 years. Thus, it makes sense that there was less genomic decay prior to the Flood, most likely because of environmental conditions. The environmental changes produced by the Flood probably introduced the mutation rates we see today, which is probably why genomic decay wasn’t a big problem until after the Flood.